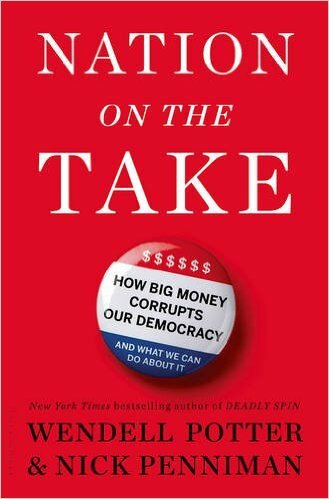 TYWKIWDBI ("Tai-Wiki-Widbee"): Money and politics. And money. We do not have a democracy. We are governed by the highest bidders. How can we change this? I don't know. But I fear for our country. No, we have an oligarchy and crony capitalism that feed each other. We can change it very easily by disallowing secret and/or big money contributions- Bernie Sanders has already shown it both possible and feasible. Women got the vote, segregation was outlawed. Yes, easier said than done- but it is simply a matter of will. As long as the US of A continues to worship its one true god, The Almighty Dollar, nothing will change. @Stan B.: The problem is twofold. Most Americans aren't even aware of the real problems facing this country and can't be bothered to pay attention long enough to learn. The second problem is that many that are aware still worship at the altar of The Almighty Dollar and have no problem with the fact that the system is rigged as long as they have the delusion that they can magically one day be the ones to rig it ("make America great again!"). The handful of those that are left have to face the waves of ignorance and greed to try and fix it. It's exhausting with a real chance of being swept away. Two year terms are simply too short. Half of the two years is campaigning, even without this need to pimp for money. The Founding Fathers screwed up with that. If Congressmen's terms were 4 years and Senators 8 years, the campaigning period would drop from 50% to 25% for House members, and from 17% to 13% for Senators. They could stagger the Senators so half come up every four years. But ALL compaigns then would coincide with a Presidential election, asssuring much higher voter turnout. In 2010 (off year), 96 million voted. In 2012 (presidential), 132 million voted. In 2014, (off year) 92 million voted. A FORTY million voter difference! In 2012 nationwide, the turnout for REGISTERED VOTERS was 86.68%. That is basically 7 out of 8. If people were registered, people VOTED. Only 1 out of 8 didn't. In Colorado, nearly 95% of registered voters DID vote. TEN states turned out 90% or better. NINETEEN states turned out 89% or better. The problem is getting people registered. Red states are slightly higher in non-registration, but not a lot. In fact, Kansas had the lowest non-registration level, 15.8%. But some states just don't register people well. Hawaii (surprisingly for me) was worst, with 41.1% not registered in 2012, even though of those that did 87.75% did vote, slightly above the national average. Assuming there is no firm data, what is your gut opinion re the reason people don't register to vote? Intrinsic personal laziness, or structural/institutional impediments to registration? There's a lot of rhetoric about the virtues of competition, but that logic isn't typically applied to Congressional districts. "Gerrymandered", which should be scandalous, does not excite the imagination. I propose that we begin to call them "monopoly districts", on the premise that we'd all be better served by competitive elections. This is what I find curious about this incessant chase for money. Most districts are not competitive. An interesting piece in the New York Review of Books added that almost no Republican fears the general election: their only concern is a challenge in the primary from the right, often funded by megadonors. Al Franken estimated that 90% of his Republican colleagues believe in man-made global warming, but dare not deviate from establishment orthodoxy lest they get a primary challenge from the right. The purpose of a huge war chest is to keep the districts non-competetive. If you're considering running and have to go up against someone with a $3 million campaign chest, you're going to think twice because you need to raise that much in a much shorter period of time. The solution may seem counterintuitive - we need to add more representation. We have 1 congressman for about every million people. That is way, way, way too high. When our country was founded, it was closer to 30,000. If we had 7,000 or so representatives, not only is there a better chance of better representation (since it would be more fine-grained), but it would be harder to "buy them off" - certainly more expensive. Plus, when they have to campaign to just 50,000 or so people, they won't need as much campaign money. That's the most interesting thought I've read all week. The difficulty, of course, would be to have appropriate districting without gerrymandering for special interests. But I suppose if the special interest representative was one of 300 representatives in a state, his/her influence would be less important. In political science, there is a formula--the cube root of the population is the ideal number of representatives (if I recall). We more or less froze our numbers around the civil war, but grew exponentially. (And before then, of course, women and blacks were not represented.) It is in the work of Rein Taagepera.